Before a deer skin can be tanned into buckskin, all the hair must be removed. While many animals have fur, a deer’s skin is covered with uncountable numbers of individual hairs. Each hair is held tightly in the skin by a root. 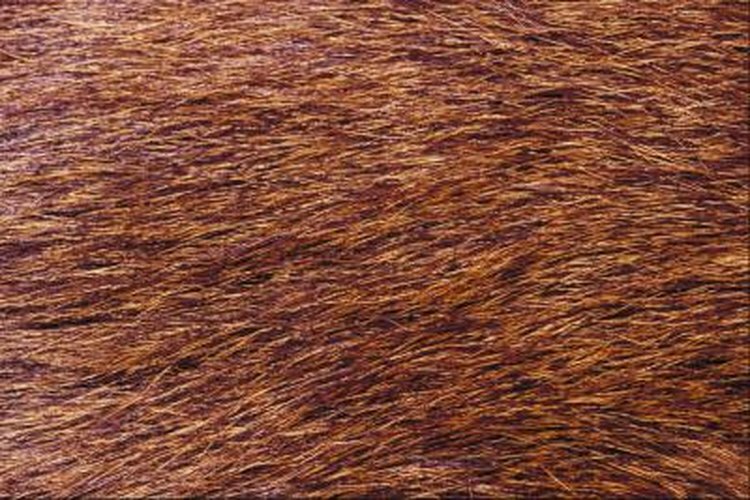 For tanning, the hair cannot be cut or pulled out; the roots must be broken down, which in turn will release the hair. This is achieved through chemical soakings and hand fleshing of the skin. Some old methods, such as soaking the skin in water until the hair falls out, serve only to rot the skin. In taxidermy the process is called “dehairing” a skin. Because the process involves chemicals, safety precautions are mandatory. Wear eye protection, a chemical resistant apron and elbow-length rubber gloves. Begin by scraping every bit of flesh and fat off the flesh side of the skin. Wash the skin in a laundry type detergent and rinse it thoroughly. Start with a large, 15 to 20 gallon, rubber or plastic container. Do not use metal, as the chemicals will eat away at the metal. Purchase calcium hydroxide and ammonium sulfate. These can be purchased through a taxidermy supply house. A 4-foot long wooden stick completes the equipment. Pour 10 gallons of warm, not hot, water into the container. Stir in 1 lb. of calcium hydroxide and mix it thoroughly with the stick. This is a hydrated lime specially formulated for taxidermy work. You can use lime bought from a home building supply store, but the result might be a ruined deer skin. Place the skin in the solution and stir the hide to get the solution into all parts of the skin. Leave the skin in this solution for two to four days. Hair roots on deer skins break down quickly, and it might be closer to two days rather than four, for the hair to begin slipping. Stir the hide regularly during this time. Check the hair by pulling on a clump of it; when the hair easily pulls loose, remove the skin from the solution. Wring out the excess water and pull all the hair off the skin. This can be done by hand, with a scraper or by using a trapper’s fleshing knife over a fleshing beam. There will be a thin layer of membrane on the skin after the hair is removed; this will need to be fleshed off completely . Rinse the dehaired skin in warm tap water. Thoroughly rinse the container and pour in10 gallons of warm water. Stir 8 oz. of ammonium sulfate into the water. This step is important to stop the action of the lime on the skin. Failure to delime the skin will hamper the tanning process. Stir the skin frequently for four to six hours. Make sure the solution reaches all parts of the skin. At the end of this time, remove the skin from the solution and rinse it in warm tap water until the water runs clear. The skin is now dehaired and ready for the tanning process.